CPSC estimates that each year there are 21,300 hospital emergency room treated injuries associated with baby walkers for children under 15 months of age. 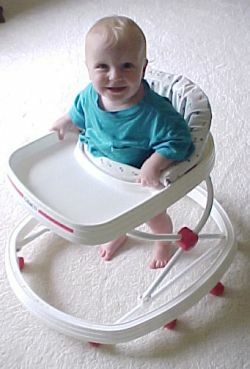 CPSC receives reports of an average one to two deaths a year with baby walkers. Most of the injuries were caused by falling down stairs. Roll right into swimming pools, ponds, etc. In addition, the added height that a walker gives to a baby can sometimes allow a baby to reach things that are unreachable to the baby otherwise. Many [babies] will not undertake the important task of crawling, creeping, scooting, or hitching. This stage is important for developing strength and coordination. Many parents think that walkers will help children learn to walk. As it turns out, walkers interfere with learning to walk. In addition to decreasing the desire to walk by providing an easier alternative, walkers strengthen the wrong muscles. The obvious step to take is clear and simple: Do not put your baby in a walker.